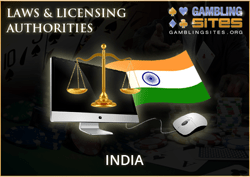 Online gambling laws in India are vague and open to interpretation. Ask 50 different people about the legality of betting in India and you'll get 50 different answers. On this page, we'll attempt to give you a thorough but concise overview of the current legal situation. Online gambling isn't specifically mentioned in any of these acts so it resides in a grey area of the law. Some could argue that the Public Gambling act of 1867 applies to online gambling since it restricts all forms of "gambling." Additionally, there's the problem that "gambling" itself is never defined by the act. The states also have the authority to regulate gambling to a degree. Two states, Goa and Sikkim, have authorized a limited number of brick-and-mortar casinos. The other states outlaw most forms of gambling, betting, and poker. The one nationwide exception is horse racing betting, which the Supreme Court ruled was a game of skill in 1996. Although most forms of real-world gambling are banned in India, there are no legal means for prosecuting those who choose to place their bets online. For that reason, India is a fast-growing market for online gambling. With 1.2 billion inhabitants and a growing middle class, India shows great potential for e-gaming operators. Offshore betting sites such as Bet365 have already entered the market and cater to Indians. At Bet365, you may deposit with Indian rupees and are welcomed to register and play all games from India. Bet365 resides outside of India and is therefore safe from the laws that ban the operation of gambling websites. And since there are no laws that prohibit individual people from placing bets online, Bet365 is able to take advantage of the legal loophole. The Public Gambling Act of 1867 made it illegal to run a gaming house or be found in one. The act describes a gaming house as "any house, walled enclosure, room or place, playing or gaming with cards, dice, counters, money or other instruments of gaming or is found there present for the purpose of gaming, whether playing for any money, wager, stake or otherwise." The penalty for being caught in one is up to a month in jail. This act predates the internet by well over a hundred years so there's a good deal of debate as to whether or not it applies to online gambling. Does a website count as a "place" where instruments of gaming are present? It depends on who you ask. "In section 6, for the words "house, walled enclosure, room or place" wherever they occur, the words "house, room, tent, enclosure, space, vehicle, vessel or place" shall be substituted." The question remains: does the internet count as a "vehicle, vessel or place?" The 1976 amendment also predates the internet, but it could be interpreted as applying to the internet. "Act not to apply to certain games.—Nothing in the foregoing provisions of this Act contained shall be held to apply to any game of mere skill wherever played." The Prize Competition Act, 1955 seems to address a very specific type of gambling, but it has been interpreted as applying to all forms of gaming in which a prize is awarded. In short, the act bans prize competitions in which the prizes exceed a thousand rupees a month. "'prize competition' means any competition (whether called a cross- word prize competition, a missing- word prize competition, a picture prize competition or by any other name) in which prizes are offered for the solution of any puzzle based upon the building up, arrangement, combination, or permutation of letters, words, or figures." The Information Technology Act of 2000 is even more difficult than the other two acts described above, because it's so broad in scope. This act still causes a great deal of controversy today due to its vague wording and harsh punishments for a wide range of infractions. Like the other two acts on this page, the Information Technology Act doesn't specifically mention online gambling. However, the following text could be interpreted to apply to internet wagering. No internet betting cases have yet to be tried under the act, so we don't yet know if it applies to gambling or not. We will have to wait and see. "Sending offensive message through electronic means - Sending any information through an electronic message that is grossly offensive or has menacing character and might cause insult, injury, criminal intimidation, enmity, hatred, or ill will, etc. or sending such mail intended to deceive or to mislead the addressee or recipient about the origin of such messages"
A violation of this portion of the act may result in imprisonment for up to three years and an unspecified crime. The Bombay High Court has already ruled that this act can be applied to content published on websites. Could online gambling be considered a message that may cause insult, injury, or ill will? Does it fall under the comically vague "etc."? We don't know. So far, we have yet to read about anyone being charged with placing bets under the law. In summary, gambling laws in India are confusing, poorly written, and haphazardly enforced. The reality of it all for online gambling specifically is that people across India bet online every day. There are no laws that criminalize the mere act of placing a few bets online. If you live in India, you have access to a wide range of internet casinos, sportsbooks, and poker rooms. There's no reason to limit yourself from enjoying the excitement and convenience provided by gaming websites. In most locations, betting over the internet is safer than doing it in person. Millions of Indians already gamble online and have had no legal issues to date. The one bit of caution we would recommend is to look into the laws in your area. Indian gaming law makes little sense and is enforced at random. You should always check with the local authorities before you place real money bets anywhere.